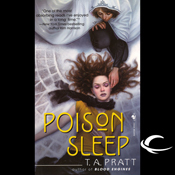 This is the second Marla Mason novel from T. A. Pratt, yet you don’t need to have read the first book to appreciate this one. Marla is once again back in her home town of Felport. Marla is the chief Sorcerer of the city and she works to keep all the other sorcerers in the city in line. A thankless job. Part crime boss, part superhero. At her side is her somewhat reluctant friend, Rondeau. He’s not one to back down from danger, but the toilets in his night club need unblocking and Marla should really learn to do her own laundry. And shopping. And driving. She could use a Personal Assistant. Freshly escaped from the Blackwing institute is a prisoner, Genevieve, who has been asleep for the last fifteen years. The Blackwing Institute is a prison that holds criminally insane sorcerers. You know, those that want to kill everyone in sacrifice to their own gods, or others that are a danger to the normal people who don’t believe in magic. Genevieve isn’t a criminal though. But she is unimaginably dangerous as her dreams affect reality. Unfortunately she has a lot of nightmares, so being catatonic for the last decade and a half has been a good thing for everyone else. As Marla and Rondeau try to find Genevieve, there is also a rouge assassin somewhere in town stalking his prey. And one of her sorcerer isn’t answering her calls. Genevieve is affecting the city more and more. It is a race to reach her when she next appears out of her dream realm and starts changing the city. Marla is a kick-in-the-door and subdue everyone kinda woman. She’s very strong and not afraid of a fight. The subtler side of negotiations sometimes elude her, particularly if they require much in the way of patience. Although Genevieve’s story is tragic and disturbing, this is a fun story and Jessica Almasy carries you smoothly into the winter of Marla’s snow-bound Felport.